that’s why Winter time is for me. 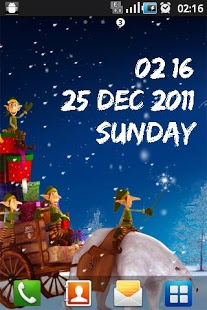 Te celebration of both Christmas and New Year happens in winter makes it much more lively. As we are equally excited as you are about the winter, thus we brings you the Winter night live wallpaper.The wallpaper features a vehicle carrying lot of gifts being driven by angels sent to earth in the night when moon is being enlightened by the rays of the sun. Follow the god sent angels in this cold during both night and day by setting this winter theme wallpaper as your winter background. The gifts sent by god signifies the auspicious nature of the winter season. As the animated snowfall is continuously falling in the background, thus making the wallpaper an excellent choice for someone who wants to celebrate the winter in a grand manner as it continuously reminds one of the joyous nature of the season and goes very well with the winter theme.The theme of the wallpaper is snowman in winter. This winter snowfall live wallpaper gives complete information to the user about the present moment, the time, day and date along with the option to choose from variety of colors and fonts according to his own choice. 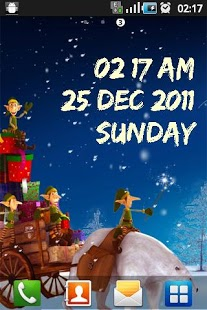 This winter theme wallpaper guarantees to provide the user a magical truly experience. 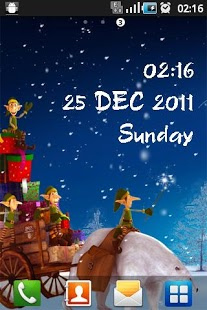 Snowflakes are falling slowly over winter landscapes and living creatures in this highly customizable live wallpaper. We will soon be releasing more winter live wallpapers for celebration of various seasons like winter, valentine day(love season), autumn season, summer season, etc. As Love is in the air and we wish you a Valentine Day full of love. Also , it will be great if you can share the wallpaper on your facebook wall as it will make your facebook profile page more lively and full of love. 1. Provides all the relevant information about the present time. 2. User has the option to choose the color of his choice. 3. User also has the option of choosing the font in which the time will be displayed. ** Live wallpapers are set in a same manner to a background. Please search for “Set Live Wallpaper” in your phone. This application is very awesome for winter lover. Our application does not use any Go Launcher theme. Now we have developed some awesome locker screen for our customer. If you will facing any problem with this application or you want to see some feature in this application kindly send me suggestion with your phone model number at promotions@creatiosoft.com.